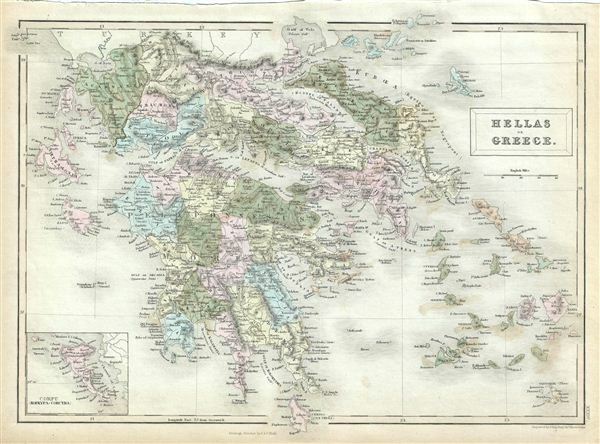 This is a fine example of Adam and Charles Black's 1851 map of Greece. It covers Greece from the Pagasetic Gulf to Cythera and includes the Cyclades as far east as Naxos. An inset in the lower left quadrant details the island of Corfu. Includes both ancient and contemporary place names. This map depicts the waning years of Ottoman hegemony in the region, with the Greek nationalist movement attaining independence for the Peloponnese in 1821. The Ionian Republic, under the protection of Great Britain, was also free of Ottoman control. The other Grecian and Balkan states, including Serbia, Croatia, Moldavia, Wallachia, Albania, and Macedonia, remained at least nominally under Ottoman control until 1878. Various cities, towns, rivers, mountains and several other topographical details are noted with relief shown in hachures. This map was engraved by Sidney Hall and issued as plate no. XXXIV in the 1851 edition of Black's General Atlas of the World. Rumsey 2305.039 (1854 edition). Philips (atlases) 4334.